Established in London in 1990, the EVA London conference, part of the international conference series EVA – Electronic Visualisation and the Arts – continuously grows in diversity of themes presented, each theme opening up a variety of complementary points of view, thus stimulating thorough questioning of the positions taken, even hesitation in choosing directions of further development. 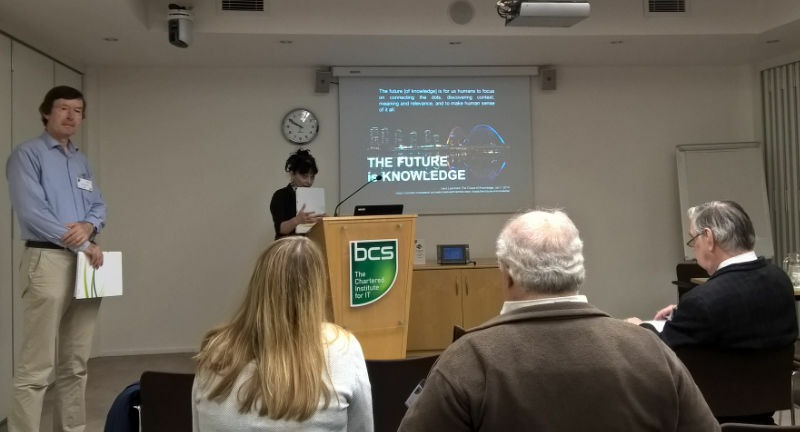 Organised by CAS – Computer Art Society – a specialist group within BCS – British Computer Society – the conference hosts interdisciplinary delegates that recognise and rely on the role of the artist as a radar within a Distant Early Warning System – DEW – as proposed by Marshall McLuhan. The discussions at the conference thus revolve around the potential of McLuhanist anti-environment set up by the artist to challenge and counter the existing technological landscape that surrounds us. The technologically infused territory we inhabit is therefore being forensically investigated throughout the conference: even the dark side of the “smart city” is being mapped out. Institutions of the smart cities have to keep up the pace to avoid the shadows – museums are thus getting smarter, too, being well aware that they need to retain, or even reclaim, the role of preserving the physical space for discussion, for freedom of expression, for engagement in a public political discourse. Throughout the conference the smartness and sentience of environment is demonstrated across different configurations of reality – pure virtuality or mixed, augmented, and otherwise extended reality, interconnecting the actual objects with their models and simulations. For instance, the idea of virtualising the city in order to model its metabolism, to simulate and improve its transportation infrastructure in real time by immediately adapting the best solutions from the virtual in the actual material world. But as the cities are becoming more and more controlled and surveyed, the citizens are not ready to give up the control – the user of any technologically enhanced environment wants to have the last word. The distrust in technology among the conference presenters goes all the way to the level of the source code itself – a tendency to dissect the code to its essence is rising. Artists and even art historians are wary of the obscurity of widely available technology, the readymade search engines of giant corporations, etc. They are coding their own versions of software for their own specific purposes, to achieve a verifiable fine-tuned control over their data collections. Furthermore, it has been demonstrated how careful visualisation of, for instance, a large collection of all submissions to art competitions, gathered over many years, makes it possible to re-examine the past decisions: by being inclusive to all submissions, even the ones that have been overlooked, rather than awarded, the ground suddenly becomes neutral and the posterity gets to decide about each entry, over and over again. Representation of the big data has been called out as problematic on several occasions during the conference, calling for awareness of the bias in the datasets and how the complexity of this bias increases with the growing amount of data. Furthermore, ways of dismantling or bypassing the power structures that gather big data without transparency have been discussed. But big data is not only to be visualized, it can be materialised as well. An enormous dataset from the meteorites colliding with the surface of the Earth, for instance, was shown as captured in stone: the kinetic event is arrested in a static medium at that very decisive moment of collision thus reaching beyond the purpose of representation. Examining the source code is not only questioning the power structures of the outside world – it can become an introspective form of self-reflection, a way of learning about ourselves. Through engagement with technology we are only beginning to realise how little we understand about our perception and cognition, our creative processes. Demonstrations of tracking ourselves during the process of creation through peripheral devices have opened up questions whether such close observation might drain out the creativity or add to it. In this inevitable process of merging with technology not only our technologically augmented perception, but our natural way of perceiving, was brought to attention. Questioning the camera as the right model for human vision, questioning if the type of perspective from the invention of camera obscura onwards, is the adequate approach, brought forward the alternative approaches to photographic modelling of reality, such as fovography, for instance. Furthermore, the intricate difference in technologies of the camera and the scanner have been explored in detail, taking the haptic side of the visual into account, as well as emulating through software a third dimension from what is considered as two-dimensional surface of contact. With perception in mind questions were posed on how do we actually recognise and semantically classify objects. Can we go beyond fixed categorisation into a post-classification system? Do we dare to work through more dynamic knowing or will we keep preserving knowledge in the static format of archives? How do the artificial neural networks learn and store knowledge? What insights do we gain if we reverse the direction of the AI learning process? Through demonstrations of artists interacting with AI it became clear how important it is that artificial neural networks learn about human emotions and empathy, thus introducing the human species to an increasingly sentient technology with which we will coexist ever more intimately. These are just some of the highlighted themes and questions the EVA London conference has dealt with this year after more than a quarter of century of continuous examination at the intersection of technology and arts. The organiser CAS and the host BCS with even longer tradition – BCS celebrating their 60th anniversary this year and CAS their 50th next year – are putting the conference in historical perspective through collaboration with institutions of selection and preservation of arts and artefacts, such as the Lumen Prize and Victoria & Albert Museum which through their work attempt to not only focus on the past but to enable a participatory envisioning of the future.